Used 1961 Chevrolet Corvette 2x4's 270hp restored Roman Red! 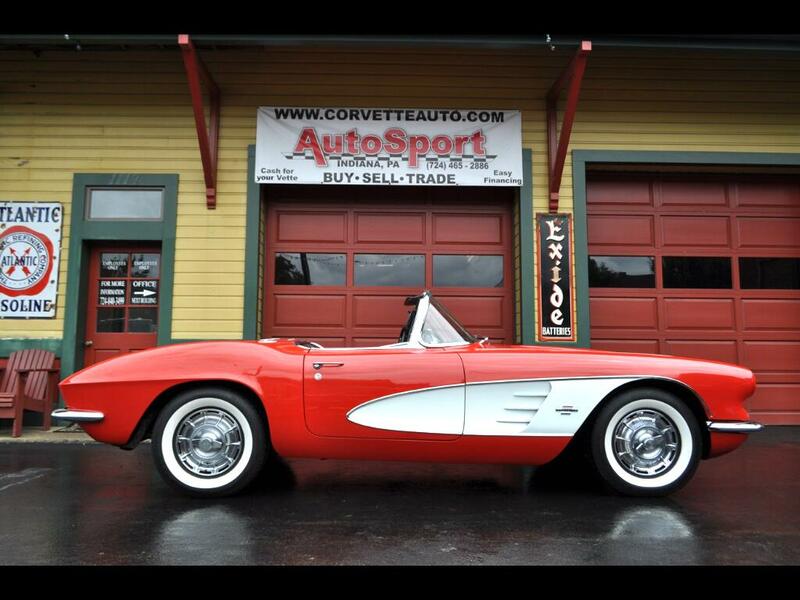 for Sale in Indiana PA 15701 AutoSport Co.
1961 Chevrolet Corvette 2x4's 270hp restored Roman Red! Trim: 2x4's 270hp restored Roman Red! For sale is a Roman Red 1961 Corvette Convertible 270hp with 2x4’s! This 1962 Corvette is optioned with; Roman Red Paint, White Coves, Black Interior, 270hp 2x4’s, 4 speed Transmission, White Convertible Soft top, & White Wall tires. The Roman Red paint is show quality with a clean deep finish. All the Chrome on this car looks new and is show quality. The body is in excellent condition with great fits and clean consistent lines all around the car. This car has a strong presence and is a show stopper. The frame is a clean solid frame. The interior is in excellent condition with all the original gauges and gear shifter. The White Convertible soft top is in excellent condition. Under the hood it is dressed correct with the factory shielding, correct air cleaner for a 2x4 set up, and right valve covers. The engine has been tuned and is much stronger than a stock 283ci 270hp. It is a 327ci Corvette engine professionally built and tuned. The tach drive AC Delco Generator works good. The tires are BF Goodrich Silvertown wide white radials and they are in good condition. The hub caps are in good condition. Inside the trunk is the spare, jack tools, trunk board and mat. This car runs strong and looks great. Please feel free to call us at 814-977-9219 or email us with any questions. Message: Thought you might be interested in this 1961 Chevrolet Corvette.